Throughout the support session, you can chat with your remote customer. You do not need to have screen sharing permissions before beginning chat. If enabled in the representative console settings, you receive pop-up notifications when chat messages are received. If you have uploaded your photo or any avatar image, it displays on the customer's chat window once the chat begins. If real-time chat translation is enabled, customers can chat with a representative in their own language. As an example, a customer whose main language is English could chat with a representative who speaks only Dutch, with the chat traffic being automatically translated in real time. 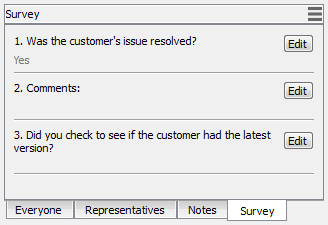 Hovering the mouse pointer over the representative's name shows which language is being used to translate the messages sent to the customer. 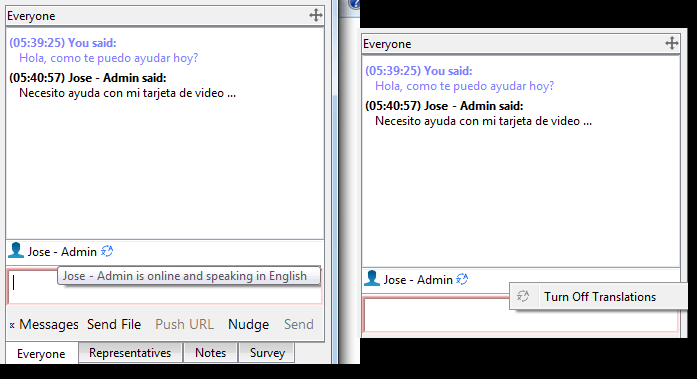 In the example shown, the representative is shown as "online and speaking in English", even though the representative is typing in Spanish. You can turn off translations by right-clicking on the translation icon and then clicking Turn Off Translations. To turn translations back on, right click the icon and click Turn Translations On. It is not possible for the customer to turn the translation process off from their side. If your administrator has configured canned messages, you can click on the Messages button at the lower left of the chat input area to insert previously written messages into the chat. Click the arrow to the left of a category name to see its messages and subcategories. Type in the search box to find a specific message. 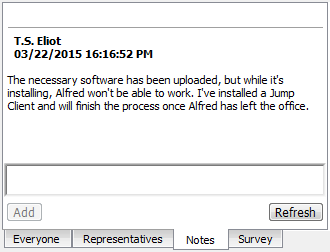 To push a file through the chat interface, click the Send File button. Pushing a URL through the chat interface will automatically open a browser on the remote system and direct it to the designated site. In order to push a URL, the web address must be the only text in the field. To attract the attention of your customer, click Nudge. This gives focus to the customer client, jiggles the customer client, and plays an audible alert on the remote system. The nudge is logged in the chat history. After sending a nudge, you must wait several seconds before you can send another nudge. The chat window records not only the messages and the time they were sent; it also serves as a running log of everything that happens throughout the session, including files transferred and permissions granted. If one or more representatives are sharing the session, you can choose to chat with all participants or to chat privately with only the other representatives. When an additional user joins a shared session, they are able to see the entire chat history. You can also add notes about the session. If the session is shared or transferred, these notes can be submitted by one representative and pulled by another for a quick, private review of the situation. These notes will also be available in the session report. Notes can be added both during the session and also after the remote connection has been terminated.